League of Legends has been such a popular online game for so long that its developer has had to treat updating it the way New York City handles its subway system: bits and pieces might be altered in tiny increments, but the overarching system never truly stops moving. So much for console generations. Ever since League developer Riot began a massive overhaul of its game’s most popular map, then, small additions and subtle visual tweaks have begun to pop up in the game every few weeks—usually alongside other balance updates and gameplay patches. Unless you pay close attention to Riot’s non-stop announcements and its public-facing beta development process for League, then, you might wake up one morning and suddenly find yourself with a brand new version of your favorite champion. That happened to me this morning with Morgana, a badass mage lady I only recently started playing in League once I discovered how much of a powerhouse she is in the game’s wonky and deliberately unbalanced April Fool’s joke “URF” mode. Last night, Riot snuck in a redesign of the champion and all her special skins. Morgana is one of the oldest champions in League of Legends—she’s been playable in the game since 2009, before the game was even officially released from its beta version. No wonder a single video game character could use some touching up when they’ve been put through the wringer so many times for 6 years. This is how all-digital, always-online, free-to-play games like League of Legends evolve: not with great big leaps that bridge the gap between distinct generations, but with countless teeny tiny steps. Only years later does the difference between League of Legends now vs. League of Legends then start to become apparent. Hopefully, the game also gets rid of some of its bugs along the way too. Lead image courtesy of Riot Games. 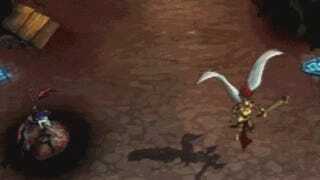 GIFs from Morgana’s old champion guide (RIP).